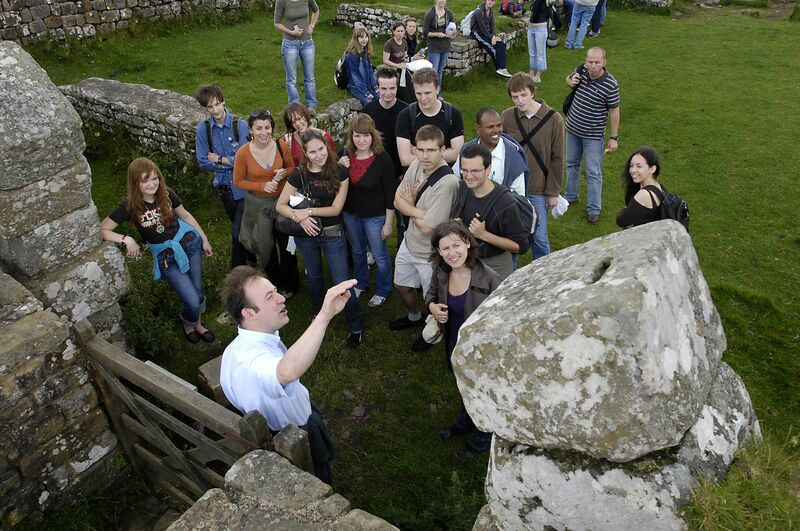 Ian Haynes, Professor of Archaeology at Newcastle University, discusses the challenges in providing students with a thorough archaeological education and discusses how new programmes at Newcastle are rising to the task. While universities are inevitably feeling the bite of this current recession, for students, graduates, and colleagues in higher education and the heritage sectors, many of the most pressing challenges go back even further. How is a unit to deliver world class teaching that continually engages with research? How can students be equipped with an education that delivers the best practical training in archaeology while simultaneously delivering the range of graduate skills now expected from all degree programmes? Neither question allows for complacency. I refuse to accept the widespread view that at BA level archaeology degrees can only really be expected to deliver generic academic skills. Having worked for field units, museums and several different universities, both in the UK and abroad, I am often struck by what I had to learn the hard way, but which could have been taught more effectively at university. Working with my Newcastle colleagues and archaeological employers to deliver new skills modules has been intensely satisfying — I feel we are addressing these challenges head on. Our new placement modules are making a difference too, students and employers alike find them attractive and informative. No less challenging is the effective development of Masters programmes. This must be understood in an international context: the UK attracts candidates studying for a Masters degree from all over the world. But how can programmes meet the diverse needs of students who come from many different systems and who will subsequently go on to work in very different institutions? These points have been very much in our minds at Newcastle as we have reviewed our Masters offerings in Archaeology, Greek and Roman Archaeology, Roman and Byzantine Archaeology and the Archaeology of Historical Periods. We have added optional pre-MA training to help students with gaps in their skill-set get up to speed before they start the degree and this year we have added two new specialisations, one in Neolithic and Bronze Age Europe, and another in Roman Frontiers Studies, both of which take advantage of the particular concentration of expertise and resource that we enjoy at Newcastle. I am particularly involved in the Frontier Studies programme and delight in the fact that so much of it can be taught on our doorstep. Of course with so many Roman sites in the vicinity and an outstanding collection of material in the museum on campus, there is a danger that the conversation can quickly turn parochial. We avoid this by travelling extensively out of the region, drawing on the University’s extensive history of research in North Africa, Central Europe and Asia Minor and by remembering that our local stretch of frontier, Hadrian’s Wall, is in many respects atypical. This is an exciting programme and the shared seminars we run with our colleagues in Human Geography, for example, ensure that the ideas and discussions are always fresh and stimulating. I believe this specialisation option will prove an excellent formation for those wishing to pursue a career in Roman provincial archaeology, whether as field archaeologists, curators or university academics (or of course, a combination of these roles). For some, it will prove an excellent spring board into doctoral research, but we are also expecting candidates whose primary aim is to spend a year deepening their knowledge of the armies and frontiers of the Roman Empire. It is long overdue at Newcastle; I am a local professional archaeologist who wasted his life savings trying to do a PhD at Newcastle, only to discover the staff had virtually no experience of practical archaeology. There was an emphasis of post-processionalism, and expertise in those things that archaeologists don’t find; if you want to study rituals, cosmologies and rituals, feel free to study here, but if you want to be an archaeologist don’t waste your time or money at Newcastle. While I was there they threw their CAD system away, because nobody knew how it worked!